This review was originally posted here. Having recently read Martin’s Nightflyers, and picked up the first volume of his graphic novelized Fevre Dream, I was insprired to pretty much revisit my George R R Martin shelf. Dreamsongs was published a few years ago, but I just saw some hardback copies at my favorite local bookstore. You may know Martin for his epic fantasy series A Song of Ice and Fire. But did you know who he was before he wrote that series? What were his inspirations? What did he think about? The answer is Dreamsongs I, which reads like an early Martin autobiography, told through story. Mostly in chronological order, Dreamsongs includes much of his early works through the early 80s, such as “The Hero“, which was sent in along with an application for conscientious objection to the conflict in Vietnam, “His Tower of Ashes” written after a bad college break-up, “The Way of the Cross and the Dragon” which was born while teaching at a Catholic School after years of being away from the fold, along with so many more tales from one of the most creative authors writing today. There are stand alone contemporary fantasy, SF and horror pieces, and many tales which take place in Martin’s created universe, The Thousand Worlds, an endless futuristic playground of planets, spaceships, and intergalactic empires. As enjoyable as the stores themselves are, my favorite part of Dreamsongs I was Martin’s essays that introduce each section. Raised with television, double features, dime bookstores, and plastic alien toys, Martin jumped on the surrounding inspiration, and never looked back. He is a vulnerable, sensitive man, wearing his heart on his sleeve. If he didn’t plan to tell the world all his secrets, his stories do it for him (Later stories, novellas, and screenplays are included in Dreamsongs II). Not every piece in the collection is a perfect work of art. Before you get to the polished pieces that were easily sold to science fiction and fantasy magazines, you’ll have to get through the superhero fan-fics and the college creative writing projects. If some of the stories sound familiar, you’re not going crazy, you may have seen them in science fiction and fantasy magazines, or in those Nebula and Hugo award anthologies that come out every year. With everything Dreamsongs I has to offer, and the beautiful artwork, the first volume is a “must-have” for any Martin fan. This review was originally posted here. And here is a great article in the local paper about Schreiber, turns out he went to high school here? very cool. I admit that I haven’t read a ghost story in a really long time. This really too bad, because a good creepy psychological thriller/ ghost story is worth it’s weight in gold. 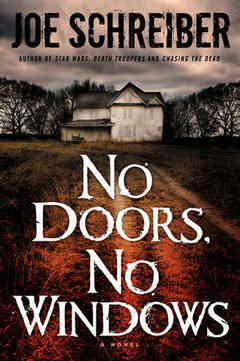 Joe Schreiber’s No Doors, No Windows is one of those thrillers. As these types of stories usually do, it starts out normal enough. After many years away, Scott Mast has come home to small town New England for his father’s funeral. It’s a little awkward being home after all these years, trying to rebuild his relationship with his alcoholic brother Owen, and help take care of Owen’s young son Henry. Scott’s high school aquaintances are still floating around town, and he can’t help but drive past the old theater that took his mother’s life in a fire 15 years ago. This review was originally posted here in October of 2008. Only after I read this book, and most of Stephenson’s Baroque cycle, did I realize that Cryptonomicon is not only vintage standard Stephenson, but an unofficial fourth book in the Baroque Cycle. Not quite science fiction, and nothing like what I expected, Neal Stephenson’s Cryptonomicon is a mental mind screw of the highest voltage. I read Cory Doctorow’s short story Little Brother a few weeks ago. Enthralled, I couldn’t help but read every snippet of end note and commentary at the end, in which Doctorow mentions how inspired he was by Stephenson’s Cryptonomicon. Off I was to the library, to seek out what seemed to be the only copy in the county library system. A novice in the science of crypto (that’s code breaking for you other novices), I wasn’t expecting a history lesson that sent me right to Google Maps to find all these places in the Pacific Theater of WWII (it is too bad the book didn’t have any handy maps). Documentaries on TV might only mention the German Enigma machine these days, but there was plenty of other code breaking going on during the war, much of it based on random numbers, mathematical equations, and the gamble that a hundred people in a room backwards engineering the formula wouldn’t figure it out in years. It was a pretty smart gamble, until early computers showed up, and could crunch the numbers in a matter of days.